The 2008 Chinese milk scandal was a widespread food safety incident in China. The scandal involved milk and infant formula along with other food materials and components being adulterated with melamine. Of an estimated 300,000 victims in China, six babies died from kidney stones and other kidney damage and an estimated 54,000 babies were hospitalized. The chemical gives the appearance of higher protein content when added to milk, leading to protein deficiency in the formula. In a separate incident four years prior, watered-down milk had resulted in 12 infant deaths from malnutrition. The scandal broke on 16 July 2008, after sixteen babies in Gansu Province were diagnosed with kidney stones. [cm 1] The babies were fed infant formula produced by Shijiazhuang-based Sanlu Group. After the initial focus on Sanlu—market leader in the budget segment—government inspections revealed the problem existed to a lesser degree in products from 21 other companies, including an Arla Foods–Mengniu joint venture company known as Arla Mengniu, Yili, and Yashili. The issue raised concerns about food safety and political corruption in China, and damaged the reputation of China's food exports. At least 11 countries stopped all imports of Chinese dairy products. A number of criminal prosecutions were conducted by the Chinese government. Two people were executed, one given a suspended death penalty, three people receiving life imprisonment, two receiving 15-year jail terms, and seven local government officials, as well as the Director of the Administration of Quality Supervision, Inspection and Quarantine (AQSIQ), were fired or forced to resign. The World Health Organization referred to the incident as one of the largest food safety events it has had to deal with in recent years, and that the crisis of confidence among Chinese consumers would be hard to overcome. A spokesman said the scale of the problem proved it was "clearly not an isolated accident, [but] a large-scale intentional activity to deceive consumers for simple, basic, short-term profits". In late October 2008, similar adulteration with melamine was discovered in eggs and possibly other food. The source was traced to melamine being added to animal feed, despite a ban imposed in June 2007 following the scandal over pet food ingredients exported to the United States. In 2012, Jiang Weisuo, a 44-year-old general manager of a dairy products plant in Shanxi province, was rumoured to have been murdered in Xi'an city. It was Jiang who had first alerted authorities to the scandal. According to the Xi'an Evening News, Jiang died in hospital on 12 November from knife wounds inflicted by his wife, Yang Ping, but the purported murder by his wife was subsequently reported to be incorrect. Melamine is used to manufacture melamine-formaldehyde resin, a type of plastic known for its flame-retardant properties and commonly employed in countertops, dry-erase boards, etc. Melamine itself is nitrogen-rich and is sometimes illegally added to food products to increase their apparent protein content. It has also been employed as a non-protein nitrogen, appearing in soy meal, corn gluten meal and cottonseed meal used in cattle feed. Melamine is known to cause kidney failure and kidney stones in humans and animals when it reacts with cyanuric acid inside the body. The use of melamine in food production is not approved by WHO or national authorities. The Kjeldahl and Dumas methods used to test for protein levels fail to distinguish between nitrogen in melamine and naturally occurring in amino acids, allowing the protein levels to be falsified. Introduced into milk, it can help conceal fraudulent dilution with water. Melamine adulteration of food products also made headlines when pet food was recalled in Europe and the U.S. in 2007. The World Health Organization (WHO) said melamine may be found "in a variety of milk and milk products at varying levels, from low ppb to ppm ranges." One academic suggested cyromazine, a melamine derivative pesticide commonly used in China for a long time, is absorbed into plants as melamine; it may therefore have long been present in products such as poultry, eggs, fish, and dairy products. It is not known where in the supply chain the melamine was added to the milk. The chemical is not water-soluble, and must be mixed with formaldehyde or another chemical before it can be dissolved in milk. Because of poor animal husbandry, production and storage and the demand for milk far outstripping supplies, the use of other potentially harmful chemical additives such as preservatives and hydrogen peroxide has been reported by independent media as being commonplace. Quality tests can be falsified with additives: peroxide is added to prevent milk going bad; industrial vegetable oil is emulsified and added to boost fat levels; whey is used to increase lactose content. However, the procurement chain is also implicated, as milk agents are often politically well-connected. Farmers report salespeople had, for years, been visiting farms in dairy areas hawking "protein powder" additives, which would often be delivered in unmarked brown paper bags of 25 kilograms (55 lb) each. A new version of "protein powder", capable of fooling dairies as to protein content, started being peddled approximately two years ago. [clarification needed] Thus, farmers either added melamine contaminant unwittingly, or turned a blind eye to milk adulteration to ensure their milk was not rejected. The big dairy producers were complicit in producing "test-tube milk". Caijing reported in 2008 that "spiking fresh milk with additives such as melamine" was no longer a secret to Hebei dairy farmers for the past two years. Because of fierce competition for supplies, and the higher prices paid by Mengniu and Yili, Sanlu's procurement became squeezed; its inspection system became compromised "as early as 2005 and allowed milk collection stations to adopt unscrupulous business practices", while government supervision was "practically nonexistent". Caijing also reported the melamine in the tainted milk may have come from scrap melamine costing ¥700 per tonne—less than one-tenth of the price of 99% pure industrial grade melamine. The melamine production process produces pure melamine by crystallisation; the melamine remaining in the mother liquor is impure (70%) and unusable for plastics, so it is scrapped. It said Sanlu's baby formula melamine content was a result of tampering by adding low-cost vegetable protein (such as low-grade soya powder), and large amounts of scrap melamine as filler. [cj 1] Scrap melamine contains impurities such as cyanuric acid that form more insoluble crystals (melamine cyanurate) than melamine alone, aggravating the problem. On 17 September 2008, Health Minister Chen Zhu stated tainted milk formula had "sickened more than 6,200 children, and that more than 1,300 others, mostly newborns, remain hospitalized with 158 suffering from acute kidney failure". By 23 September, about 54,000 children were reported to be sick and four had died. An additional 10,000 cases were reported from the provinces by 27 September. A World Health Organization official said 82% of the children made ill were 2 years of age or below. The Hong Kong Centre for Food Safety said that 99 percent of the victims were aged under 3 years. Ten Hong Kong children were diagnosed with kidney problems, at least four cases were detected in Macau, and six in Taiwan. Non-human casualties included a lion cub and two baby orangutans which had been fed Sanlu infant formula at Hangzhou Zoo. The government said on 8 October it would no longer issue updated figures "because it is not an infectious disease, so it's not absolutely necessary for us to announce it to the public." Reuters compiled figures reported by local media across the country, and said the toll stood at nearly 94,000 at the end of September, excluding municipalities. Notably, 13,459 children had been affected in Gansu, Reuters quoted Xinhua saying Henan had reported over 30,000 cases, and Hebei also had nearly 16,000 cases. In late October, the government announced health officials had surveyed 300,000 Beijing families with children less than 3 years old. It disclosed approximately 74,000 families had a child who had been fed melamine-tainted milk, but did not reveal how many of those children had fallen ill as a result. Because of the many months before the scandal was exposed, the media suggest the official figures are likely to be understated. Kidney stones in infants started being reported in several parts of China in the past two years. A number of yet-to-be-officially-acknowledged cases were reported by the media. However, those deaths without an official verdict may be denied compensation. On 1 December, Xinhua reported that the Ministry of Health revised the number of victims to more than 290,000 with 51,900 hospitalized; authorities acknowledged receiving reports of 11 suspected deaths from melamine contaminated powdered milk from provinces, but officially confirmed three deaths. On characterisation and treatment of urinary stones in affected infants, the New England Journal of Medicine printed an editorial in March 2009, along with reports on cases from Beijing, Hong Kong and Taipei. Urinary calculi specimens were collected from 15 cases treated in Beijing and were analysed as unknown objects for their components at Beijing Institute of Microchemistry using infrared spectroscopy, nuclear magnetic resonance, and high-performance liquid chromatography. The result of the analyses showed the calculi were composed of melamine and uric acid, and the molecular ratio of uric acid to melamine was around 2:1. In a study published in 2010, researchers from Peking University studying ultrasound images of infants who fell ill in the 2008 contamination found while most children in a rural Chinese area recovered, 12 percent still showed kidney abnormalities six months later. "The potential for long-term complications after exposure to melamine remains a serious concern", the report said. "Our results suggest a need for further follow-up of affected children to evaluate the possible long-term impact on health, including renal function." Contaminated products found in the China AQSIS tests include baby formula products produced by the following companies, in order of highest concentration found. Shijiazhuang Sanlu Group, Shanghai Panda Dairy, Qingdao Shengyuan Dairy, Shanxi Gu Cheng Dairy, Jiangxi Guangming Yingxiong Dairy, Baoji Huimin Dairy, Inner Mongolia Mengniu Dairy, Torador Dairy Industry (Tianjin), Guangdong Yashili Group, Hunan Peiyi Dairy, Heilongjiang Qilin Dairy, Shanxi Yashili Dairy, Shenzhen Jinbishi Milk, Scient (Guangzhou) Infant Nutrition, Guangzhou Jinding Dairy Products Factory, Inner Mongolia Yili Industrial Group, Yantai Ausmeadow Nutriment, Qingdao Suncare Nutritional Technology, Xi'an Baiyue Dairy, Yantai Leilei Dairy, Shanghai Baoanli Dairy, and Fuding Chenguan Dairy. The scandal began with revelations of contamination of Sanlu milk products. The New Zealand dairy cooperative Fonterra, which owned a 43% stake in Sanlu, said they were alerted to melamine contamination on 2 August (almost a month before the issue became public), and have said to have pushed hard for a full public recall. Although there was an immediate trade recall, Fonterra said that local administrators refused an official recall. A Fonterra director had given San Lu management a document detailing the European Union's permitted levels of melamine, but Fonterra chief executive Andrew Ferrier has stated that at no time did Fonterra say small amounts of melamine were acceptable. From 2005 to 2006, an agent, Jiang Weisuo, from Shaanxi Jinqiao Dairy Company in northwest China reportedly publicly discussed his fears about unauthorised substances being added to competitors' milk. His complaints to regulators and dairy makers in 2005 and 2006 never yielded any result; his story was picked up by China Central Television, who ran a report complete with footage of adulteration in progress, yet the Shaanxi Quality and Technical Supervision Bureau said they failed to find evidence of wrongdoing. The bulletin board of the Administration of Quality Supervision, Inspection and Quarantine (AQSIQ) indicated a rare occurrence of kidney stones in children–all causally traced to Sanlu milk formula–was flagged by at least one member of the public in June 2008 and by a urologist in a paediatric hospital on 24 July 2008. Neither received definitive replies. The paediatrician, who specifically asked the AQSIQ to refer his observations to epidemiologists, was asked to refer his query to the health department. In June, Jiangsu media reported a two-month surge in the number of babies diagnosed with kidney disease; in July, a parent of a sick baby in Hunan questioned Sanlu's powdered milk and complained to the AQSIQ. Gansu Province sent a report to the Ministry of Health on 16 July to alert that one local hospital had identified an increase in the incidence of kidney ailments among babies in the months earlier, and that most victims had consumed Sanlu's baby formula. The health ministry sent investigators to Gansu in early August. Fonterra notified the New Zealand government on 5 September and three days later, the Prime Minister Helen Clark had Beijing officials alerted directly. News reports began circulating in China on 9 September, the news broke internationally a day later by Reuters. The state-controlled media report did not initially identify the company involved, postings on Tianya.cn, a Chinese social portal, named Sanlu as the culprit. Sanlu initially denied the allegations. A State Council investigation revealed Sanlu began receiving complaints about sick infants as far back as December 2007, but did no tests until June 2008. It said leading government officials in Shijiazhuang city had failed to report the contamination to provincial and state authorities (until 9 September) in violation of rules on reporting major incidents involving food safety. According to the People's Daily, Sanlu wrote a letter to Shijiazhuang city government on 2 August 2008, asking for help to "increase control and coordination of the media, to create a good environment for the recall of the company's problem products ... to avoid whipping up the issue and creating a negative influence in society." According to accounts confirmed by media reports and health officials, the company tried to buy off critics and cover up the contamination. In a memo dated 11 August, Beijing-based public relations agency Teller International advised Sanlu to seek cooperation with major search engines to censor negative information. The agency reportedly had repeatedly contacted key account staff at Baidu and proposed a ¥3 million (US$440,000) budget to screen all negative news. After the memo began circulating on the internet, Baidu denounced, in a communiqué on 13 September 2008, the approaches by said agency on several occasions, saying the proposal was firmly rejected, as it violated their corporate principles of unbiased and transparent reporting. Helen Clark said of the local government: "I think the first inclination was to try and put a towel over it and deal with it without an official recall." Western media speculated China's desire for a perfect summer Olympics contributed to the delayed recall of the baby milk, citing a guideline allegedly issued to Chinese media that reporting food safety issues, such as cancer-causing mineral water, was "off-limits" although the Central government denied issuing this guidance. Hebei provincial vice-governor said his administration was only notified by Shijiazhuang on 8 September. However, a journalist at Southern Weekend wrote an investigative report in late July for publication about infants who had fallen ill after consuming baby formula from Sanlu. Six weeks later, senior editor Fu Jianfeng revealed on his personal blog that this report had been suppressed by authorities, because of the imminent Beijing Olympics. While this was happening, Sanlu was honoured in a national award campaign called "30 Years: Brands that Have Changed the Lives of Chinese." The press release on the award, written by a senior public relations manager at Sanlu, passed as news content on People's Daily and in other media. On 15 September, the company issued a public apology for the contaminated powdered milk; Sanlu was ordered to halt production, and to destroy all unsold and recalled products. Authorities reportedly seized 2,176 tons of powdered milk in Sanlu's warehouses. An estimated 9,000 tons of product had been recalled. Tian Wenhua, Chairwoman and general manager of Sanlu and Secretary of the Sanlu Communist Party chapter was stripped of her party and functional posts during an extraordinary meeting of the Hebei provincial standing committee of the CCP; four Shijiazhuang officials, including vice mayor in charge of food and agriculture, Zhang Fawang, were reportedly removed from office. Shijiazhuang Mayor Ji Chuntang resigned on 17 September. Li Changjiang, minister in charge of the AQSIQ, was forced to resign on 22 September after the State Council inquest concluded he was responsible for the "negligence in supervision". Investigators also blamed the Shijiazhuang government. Local Party Secretary Wu Xianguo was fired on the same day. Sanlu GM Tian was charged under Articles 144 and 150 of the criminal code. A spokesman for the Hebei Provincial Public Security Department said police had arrested 12 milk dealers and suppliers who allegedly sold contaminated milk to Sanlu, and six people were charged with selling melamine. Three hundred kg of suspicious chemicals, including 223 kg of melamine, were confiscated. Among those arrested were two brothers who ran a milk collection centre in Hebei for allegedly supplying three tonnes of adulterated milk daily to the dairy; the owner of another collection centre which resold seven tons of milk a day to Sanlu, was arrested, and his operation was shut down. Zhang Yujun (alias Zhang Haitao), a former dairy farmer from Hebei, produced more than 600 tons of a "protein powder" mixture of melamine and maltodextrin from September 2007 to August 2008. He and eight other traders, dairy farm owners and milk purchasers who bought the powder from him were arrested in early October, bringing the total to 36. During the week of 22 December 2008, 17 people involved in producing, selling, buying and adding melamine in raw milk went on trial. Tian Wenhua, former Sanlu general manager, and three other company executives appeared in court in Shijiazhuang, charged with producing and selling milk contaminated with melamine. According to Xinhua, Tian pleaded guilty, and told the court she learned about the tainted milk complaints from consumers in mid-May. She then apparently headed a working team to handle the case, but did not report to the Shijiazhuang city government until 2 August. The Intermediate People's Court in Shijiazhuang sentenced Zhang Yujun and Geng Jinping to death, and Tian Wenhua to life in prison, on 22 January 2009. Zhang was convicted for producing 800 tons of the contaminated powder, Geng for producing and selling toxic food. Geng Jinping managed a milk production center which supplied milk to Sanlu Group and other dairies. The China Daily reported Geng had knelt on the courtroom floor and begged the victim's families for forgiveness during the trial. The court also sentenced Sanlu deputy general managers Wang Yuliang and Hang Zhiqi to fifteen years and eight years in jail, respectively, and former manager Wu Jusheng to five years. Several defendants have appealed. Zhang Yujun and Geng Jinping were executed on 24 November 2009. The value of the company plunged as a result of the scandal. On 24 September, Fonterra announced it had written down the carrying value of its investment by NZ$139 million (two-thirds), reflecting the costs of product recall and the impairment of the 'Sanlu' brand because of the "criminal contamination of milk". By 27 September, China Daily reported Sanlu was close to bankruptcy, and might be taken over by the Beijing Sanyuan Foods Company. The company is also facing lawsuits from parents (see Anger at Sanlu). The Beijing Review said Sanlu expects to have to pay compensation claims totaling ¥700 million, and it became clear the company would be broken up and sold. On 25 December, Shijiazhuang court accepted a creditor's bankruptcy petition against Sanlu. Media commentators expected the Sanlu distribution network to be sold. On 16 September, the AQSIQ released test of samples from 491 batches of products sold by all 109 companies producing baby formula. It said all 11 samples from Sanlu failed the melamine test. Sanlu, whose products sell at half the price of equivalents on the market, recorded the highest levels of contamination among all the samples tested, at 2,563 mg/kg or parts per million ("ppm"). Tainted samples were found among 21 other suppliers, where concentrations ranged from 0.09 to 619.00 ppm. There was melamine contamination in 10% of liquid milk samples from Mengniu and Yili, and 6% of those from Bright Dairy. On discovery of contamination, the three major producers were all stripped of their status as 'Chinese national brands'. Yili, Mengniu and Bright Dairy & Food Co. recalled tainted powdered milk and apologised in separate statements. Mengniu recalled all its baby formula, and trading in its shares on the Hong Kong Stock Exchange was suspended on 17 September. Shares in other dairy companies fell strongly the next day. Mengniu's CFO attempted to reassure consumers by offering a no-quibble refund on all products, and by drinking liquid milk in front of reporters in Hong Kong. He also said that its export products were less likely to be contaminated. On 30 September, the AQSIQ announced test results of a further 265 batches of powdered milk produced by 154 different companies prior to 14 September, where it found 31 batches produced by 20 domestic dairy companies were tainted with melamine. On 1 December, China's Ministry of Health issued an update, saying nearly 300,000 babies were sickened after consuming melamine-contaminated infant formula. In response to the surge of contaminated Chinese products, the United States Food and Drug Administration opened its first overseas inspection offices in November 2008, with bureaus in Shanghai, Beijing and Guangzhou. The State Council ordered the testing of product of all dairy producers, and to this end, some 5,000 inspectors were dispatched. The Chinese market has grown at an average annual rate of 23% since 2000. In 2006, milk production reached 30 million tons, ten times the volume of a decade before. It was valued at some ¥122 billion (US$18 billion) in 2007, and consumers had severely lost confidence in the industry. The events have exposed the often-incestuous relationship between local business and local government. In addition to the tax revenues to local authorities—Sanlu contributed ¥330 million in 2007, many companies invite local officials to become "silent partners" in their corporations—in return for "protection" at the political level; former Sanlu chairman Tian Wenhua, was made honorary deputy to the Provincial People's Congress. The scandal has also highlighted structural problems of inadequate production volume, inherent quality issues, and poor production methods. The Inner Mongolia region produces over one-fourth of China's milk, and Mengniu and Yili have invested millions to establish state-of-the-art dairy facilities in its capital, Hohhot. The companies still rely on small-scale farmers for over 90% of their production because of the capacity constraint of the modern facilities. Both companies were said by farmers and agents to have habitually purchased milk which failed quality tests, for only two-thirds the normal price. A new policy was put in place on 17 September to stop that practice. 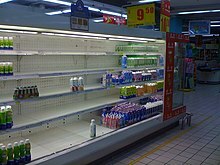 Consumer panic resulting from the contaminated milk lessened demand for dairy products, causing hardship to more than 2 million Chinese farmers who had nowhere to sell their milk and no means by which to support their dairy cows. Farmers reportedly poured away milk and faced selling cows to a buyerless market. Mengniu-Arla, joint-venture between Danish/Swedish co-operative Arla Foods and Mengniu halted production on 16 September 2008 after three of 28 tests taken from Mengniu showed traces of melamine; the contaminated batches had been recalled. Mengniu, milk supplier to Starbucks, was replaced by Vitasoy when the coffee retailer eschewed milk in favour of soya milk in its China operations. KFC also suspended selling Mengniu milk. Tokyo-headquartered Lotte Group, a major snacks maker, recalled its Koala's March cookies in Hong Kong and Macau because of contamination, and promised to "look deeply into all the details of the manufacturing process" to preserve customer confidence. The range was also ordered off Dutch and Slovakian shelves. Its Chocolate Pie was seized when samples tested positive in Malta. On 29 September, British confectionery group Cadbury was forced to withdraw its 11 chocolate products in China on suspicion of melamine contamination, in turn causing it to close down its three factories in China. The recall affected the China markets, as well as Taiwan, Hong Kong, Japan, Korea and Australia. Tests in Hong Kong found excessive amounts of melamine in China-made Dairy Milk products. On 30 September, Unilever recalled its Lipton milk tea powder after the company's internal checks found traces of melamine in the Chinese powdered milk used as an ingredient. Heinz recalled cases of baby cereal in Hong Kong after discovering they contained melamine. Nestlé's factory in Heilongjiang was also implicated: the Taiwanese Department of Health forced the delisting of six Neslac and KLIM products on 2 October for containing minute traces of melamine, although the minister said they did not pose a significant health risk. Since the milk crisis broke, Nestlé says it has sent 20 specialists from Switzerland to five of its Chinese plants to strengthen chemical testing. On 31 October, it announced the opening of a $10.2 million Beijing research and development centre, to "serve as the base and the reference in food safety for Nestlé in Greater China." Nestlé Chief Technology Officer said the centre was equipped with "highly sophisticated analytical tools for detecting trace amounts of residues and undesirable compounds like melamine or veterinary drugs or natural toxins". There were concerns dairy products consumed during the 2008 Summer Olympic games may have been contaminated. Li Changjiang, the then Director of AQSIQ reassured the international community that all the food, including dairy products, was indeed safe. "We took special quality management measures aimed at food supply for the Games." PRC Customs said exports of dairy products and eggs in 2007 were valued at US$359 million, a year-on-year increase of 90 percent. Since the news of the melamine contamination began to circulate, at least 25 countries stopped importing Chinese dairy products. A number of countries had imposed blanket bans on Chinese milk products or its derivatives—among which were Bangladesh, Bhutan, Brunei, Burundi, Cameroon, Chile, Colombia, Dominican Republic, Gabon, India, Côte d'Ivoire, Maldives, Mali, Mexico, Nepal, Papua New Guinea, Paraguay, South Korea, Suriname, Tanzania, Togo, and the United Arab Emirates —joining Indonesia, Taiwan, Japan, Singapore and Malaysia which had also imposed specific bans on Chinese dairy products which tested positive for melamine. The scandal destroyed all trust in locally produced infant formula, and since then many Shenzhen residents and parallel traders travel across the border to purchase powdered milk from Hong Kong shops. Lower confidence in Chinese production, combined with the relaxation of visa requirements for mainland citizens, had resulted in severe shortages of infant formula in Hong Kong for an extended time. Because of a great public outcry, the Import and Export (General) (Amendment) Regulation 2013 was passed in Hong Kong, prohibiting the unlicensed export of powdered formula, including milk and soya milk powder for infants and children under 36 months. According to the HK government, the regulation is not applicable to "powdered formula that is exported in the accompanied personal baggage of a person aged 16 or above leaving Hong Kong if the person did not leave Hong Kong in the last 24 hours and the formula does not exceed 1.8 kg in total net weight." Although the Hong Kong government imposed a strict 2-can limit on the export of infant formula in March 2013, spurred price differentials caused by sales tax on the mainland and lax customs, trafficking activity including for powdered milk continues, exacerbating Hong Kong-Mainland conflict. The catchment area for traffickers has spread from Fan Ling and Sheung Shui southward to Yuen Long and Tuen Mun, causing localist groups such as Civic Passion and Hong Kong Indigenous to take to the streets in direct action in 2015. On 25 September 2008, the EU announced a ban on imports of baby food containing Chinese milk. The European Commission also called for tighter checks on other Chinese food imports; isolated contaminated products were found in the Netherlands, and the French authorities ordered all Chinese dairy products off the shelves; Tesco removed White Rabbit as a precaution from its stores in the United Kingdom. In the United States of America, which was otherwise unaffected by the scares, the US distributor of White Rabbit candies recalled the product when samples found in Hartford showed traces of melamine. The candy's maker and subsidiary of Bright Foods, Guan Sheng Yuan, issued a recall to the 50 countries to which it exported. The U.S. Food and Drug Administration said while food containing melamine below 2.5 parts per million generally did not raise concerns, its scientists were "currently unable to establish any level of melamine and melamine-related compounds in infant formula that does not raise public health concerns". On 12 November 2008, the FDA issued a general alert against all finished food products from China, saying that information received from government sources in a number of countries indicates a wide range and variety of products from a variety of producers have been manufactured using melamine-contaminated milk was a recurring problem. In late November, after FDA found traces of melamine in one Nestle and one Mead Johnson infant product, the FDA concluded melamine or cyanuric acid alone, "at or below 1 part per million in infant formula do not raise public health concerns" in babies. The European Food Safety Authority (EFSA) warned that children who ate large amounts of confectionery and biscuits with high milk content could theoretically be consuming melamine at more than three times above prescribed EU safety limits (0.5 mg/kg of body weight). The EFSA said children with a mean consumption of products such as milk toffee, biscuits and chocolate containing contaminated powdered milk would not be at risk, and adults would not be at risk even in the worst-case scenarios. The World Health Organization, which was only notified on 11 September, asked Beijing why it took so many months for the scandal to become public, and to establish whether failure was deliberate or due to ignorance. WHO's representative in China, Hans Troedsson, said the issue of who knew what and when was critical "... Because if it was ignorance, there is a need to have much better training and education ... if it is neglect, then it is, of course, more serious." Following a spate of mass national bans, the WHO urged national food safety authorities on 25 September 2008 to test Chinese dairy products for health risks before slapping on import bans or recalls. WHO and UNICEF also jointly decried the "particularly deplorable ... deliberate contamination of foods intended for ... vulnerable infants and young children" On 26 September, the WHO warned health officials around the world to be alert for dairy products of Chinese origin that could be tainted. Anthony Hazzard, the Western Pacific director of the World Health Organization said countries had been advised by the International Food Safety Authorities (INFOSAN) to focus particularly on smuggled formula. The WHO referred to the incident as one of the largest food safety events it has had to deal with in recent years. It says the crisis of confidence among Chinese consumers would be hard to overcome. It saw regulation failing to keep pace with the rapid development of the food and industrial production as opening the gates to all types of misbehaviour and malfeasance. The spokesman said the scale of the problem proved it was "clearly not an isolated accident, [but] a large-scale intentional activity to deceive consumers for simple, basic, short-term profits." WHO Director-General Margaret Chan reminded Chinese mothers that babies not breastfed were being deprived of the best nutrition offered by nature, while risking being exposed to the effects of melamine. She added: "We need to try our very best to tell [mothers] the difference [between breast milk and formula]. Of course breastfeeding is the best food for babies." Chan said the melamine-in-milk scandal showed "the impact and power of globalisation" in food distribution and highlighted "the importance of seamless cooperation from farm to consumer". The case has brought anger and resentment towards milk producers and sowed uncertainty and confusion amongst the population. Queues formed outside Sanlu's offices for refunds. The Sanlu website was hacked several times and its name as displayed in the header bar changed to 三聚氰胺集团 ("The Melamine Group") in a play of words on the character "三" (number 3), which is the first word of Sanlu's Chinese name: 三鹿 (Three Deer); "Melamine" was also added as a product name by a hacker. As has been increasingly common practice, web users vented their anger on internet bulletin boards. Prevalent food scares have increased the number of online parodies circulated by netizens. Those inspired by Sanlu have been along themes of passing the buck, stones, or the virtues of not being able to urinate. Celebrities who have endorsed dairy products have also been mocked in photoshopped images. Before the government began offering free medical treatment, some parents had reportedly spent small fortunes on medical care for their sick children. Children who fell ill before the scandal broke on 12 September were not entitled to free medical care offered by the State. Parents of two such victims, one from Henan and one from Guangdong, filed writs against Sanlu despite government pressure. Parents of the Henan child had claimed ¥150,000 for medical, travel and other expenses incurred after their child developed kidney stones. On 20 October, the parents of one baby who died from contaminated milk appealed to New Zealand for justice on TV ONE. They were quoted as saying the perpetrators of the milk scandal responsible for the death of their child deserved to "die a thousand deaths". A total of nine cases were filed against Sanlu in Shijiazhuang. Following weeks of discussions, and in the absence of a compensation plan, a group of 15 lawyers filed a collective suit on behalf of 100 families against Sanlu, seeking medical and other expenses as well as compensation for trauma and for death of an offspring. There is growing resentment towards the country's leaders due to the perception that they are not troubled by the food security turmoil faced by ordinary citizens: in a speech delivered by Zhu Yonglan (祝詠蘭), Director of the State Council Central Government Offices Special Food Supply Centre (CGOSFSC) in August 2008, Zhu disclosed that her firm had been set up in 2004 to source high-quality, all-organic foodstuffs from farms working under the strictest guidelines, for supply to top political leaders, their families and retired cadres. "The State Council Party and State Organisations Special Food Supply Centre ... is supported by the State Council Logistics Base, Central Security Bureau farms, and supply bases spread over all 13 provinces, municipalities ... and autonomous regions. These bases supply the 94 ministries' and commissions' veteran cadres with high quality organic food products ... [Our] products accord with the highest standards." ... Everyone knows that at present average production facilities use large quantities of chemical fertilizers and pesticides. Antibiotics and hormones are used in the raising of animals. Aquatic animal products are raised in polluted waters. All of these toxins end up in the final food products (all kinds of produce, meat, dairy products etc.). It goes without saying that these are harmful when consumed by humans." Premier Wen Jiabao apologised to the nation, saying he felt "extremely guilty" about the poisoned milk products, in the same way he had previously asked the people's pardon for the deaths of coal miners, polluted drinking water, and train passengers stranded by the authorities' inadequate response to the severe snowstorm during the New Year. Author Qin Geng (秦耕) said: "The big picture in this case was the interest of one-party rule above anything, not that they would put the safety of the people first". Qin concluded what the Chinese public were told by the state-controlled media the contamination of milk is a well orchestrated process, and they are "very sad, very frightened and very concerned". The melamine food scare became a focal point against the warming relations between Taiwan's government and the Chinese government, and a major demonstration was held by the opposition Democratic Progressive Party on 25 October 2008 to voice dissatisfaction with Taiwan's increasingly closer ties with Beijing, notably related to the incident. Protesters fearful at reunification blamed the Kuomintang for the melamine scare, and criticised it for failing to stand up to China over the contamination. One citizen voiced concern that President Ma Ying-jeou's promise for closer ties with China would bring in more tainted products to Taiwan. The Minister of the Department of Health, Lin Fang-you, was heavily criticised for raising the legally acceptable limit of melamine in food products from zero to 2.5 ppm. The public outcry subsequent to the move forced Lin to resign. His successor, Yeh Ching-chuan, announced a return to the original zero-tolerance policy to melamine. AQSIQ announced the revocation of all exemptions from inspection previously granted to dairy producers, who were asked to cease citing the privilege in their advertisements. The State Council ordered an overhaul of the dairy industry, and promised to provide free medical care to those affected. Formally, the State Council released its initial findings, and a top-level official apology of the incident both came on 21 September. Wen Jiabao apologised while visiting victims in hospitals. “ This incident made me feel sad, though many Chinese have been understanding. It disclosed many problems for government and company supervision of the milk sources, quality and marketing administration ... The government will put more efforts into food security, taking the incident as a warning. What we are trying to do is to ensure no such event happens in future by punishing those leaders as well as enterprises responsible. None of those companies without professional ethics or social morals will be let off. CPC general secretary Hu Jintao said on 1 October 2008: "Food safety is directly linked to the well-being of the broad masses and the competence of a company ... Chinese companies should learn from the lessons of the Sanlu tainted milk powder incident." On 6 October 2008, putting the blame on "illegal production and greed", the country's "chaotic dairy production and distribution order", and the "gravely absent supervision" for the crisis, the State Council announced new dairy industry regulations. On 9 October 2008, in an attempt to control the damage to Chinese dairy exports, officials at a World Trade Organization meeting insisted that contamination had been "accidental", directly contradicting the WHO observations. Chinese trade representatives criticised countries which have imposed blanket bans on Chinese food products. They urged member states to base import restrictions on scientific risk assessments, and to use official WTO notification mechanisms. On 11 October, Deputy Health minister Liu Qian stated that all the foreign companies' application for compensation for dairy products recall would be dealt with on a commercial basis, although government may use diplomatic channels if necessary, if problems were encountered. According to a senior quality inspectorate official, the government aimed to establish nearly 400 product testing centres within the next two years, and 80 of these would be food testing centres. Working groups were established in nearly every single province in order to set up new food testing centres and replace outdated equipment. On 24 September 2008, China's newly appointed AQSIQ chief Wang Yong said that the government would "carry out 'forceful' measures to deal with the chemical contamination"; it's inspectors had removed 7,000 tonnes of melamine contaminated dairy products from shops all over China. On 4 October, the Ministry of Agriculture announced it had drawn up an emergency rescue plan with the Ministry of Finance to give special subsidies to dairy farmers, seriously affected by the lack of demand following the contamination scandal; local governments had already drafted policies to stabilise the dairy industry; 150,000 officials had been sent to overhaul the entire supply chains from cattle feed to milk collection; 18,803 milk-collecting stations had been registered and checked by these officials. The ministry was reported to have investigated 98 dairy producers and farms, banned 151 illegal companies and indicted three manufacturers for feed containing melamine. During an investigation into melamine contamination at Yili and Mengniu in Hohhot, police arrested six more people for allegedly selling and mixing melamine into raw milk. The AQSIQ announced on 5 October that all tests showed all milk produced after 14 September were free from contamination. The General Administration of Quality Supervision, Inspection and Quarantine stated all dairy products made before 14 September will be tested for melamine. They gave notice to all supermarkets, shops, and all city, town and village-level vendors to urgently remove and seal up all powdered milk and liquid milk made before 14 September, pending further testing. The Ministry of Health and five other government agencies issued a joint statement on 9 October, setting the legally acceptable level of melamine content in infant formula at 1 ppm (1 mg/kg), and at 2.5ppm in other dairy products (including milk). The Chinese Centre for Disease Control and Prevention said that any amount exceeding 1 ppm would give reason to suspect its presence was intentional." On 26 September 2008, in order to quell the disquiet over the speech by Zhu Yonglan of the CGOSFSC regarding leaders' insulation from the food-security issues faced by the general population, Xinhua issued a brief statement, in Chinese, denying the existence of the Centre, the award, or any person named Zhu Yonglan, saying these were "purely rumours". On 16 September, the AQSIQ tests on baby milk powder produced by 109 companies showed 69 batches from 22 companies to be melamine-contaminated; the State Council attempted to reassure that formula produced by most companies in China was safe. It said: "the number of companies with melamine-tainted milk accounted for 20.18% of the total of powdered milk companies in China; the number of tainted batches accounted for 14.05% of the total batches tested." On 30 September, the AQSIQ said its tests on 265 batches from 154 companies showed that "only 18%" had tested positive for melamine: "of the 290 dairies nationwide 154 dairies, representing 87% market share, 134 of these dairies had tested negative for melamine." On 16 September, the AQSIQ published results of tests on 408 liquid milk producers, and found "most dairy products were safe to drink", although the test results showed nearly 10 percent of batches from Mengniu, Yili and Bright were contaminated. The government stressed that no new cases of melamine-related illnesses had been detected since 20 September, and that test results on samples from 31 brands of baby formula, 84 brands powder for adult consumption, and 75 domestic brands of liquid milk produced after 14 September did not contain melamine, the AQSIQ said. To demonstrate that its emergency measures had been effective, the Ministry of Agriculture said the rate of raw milk dumping because of the contamination scandal has decreased from 23.6% on 22 September to 4.6% on 1 October. Behind the scenes, China's media was ordered to tone down coverage of the unfolding scandal to prevent unrest. News editors were ordered to adhere to the official copy of Xinhua. Traditionally, media knows to avoid negative news coverage, and CCTV shifted reporting emphasis on the forthcoming launch of Shenzhou VII. The announcement of the AQSIQ test results was relegated to the final item on the CCTV evening news. The Wall Street Journal reported that the suppression of bad news had not improved since the scandal was uncovered: media rigidly adheres to the official line, as ordered; Chinese consumers were ill-informed about the extent of global recalls. It reported local journalists saying that discussion of the causes of the crisis, government responsibility, questions about government complicity with dairy companies, was strictly off limits. On 2 January, a website created by individuals protesting against Sanlu was also blocked by the authorities. A group of parents whose children were rendered ill by melamine-contaminated milk held a news conference to draw attention to the plight of their sick children; five were allegedly detained by police and taken to a labour camp outside Beijing. They were released a day later. A group of 90 lawyers from Hebei, Henan and Shandong—the three worst affected provinces—had made pro bono offers to assist victims, and a list of their names was published. Organisers of the group declared that they had come under pressure from officials to not get involved in the issue. The Beijing Lawyers' Association, a part of the Communist Party apparatus, asked its members "to put faith in the party and government". Other members of the group have reportedly received less subtle requests. Authorities are said to fear social unrest if lawsuits were unleashed. Pro-Beijing Hong Kong journal Ta Kung Pao reported that central authorities, fearful of the effect of mass lawsuits, held a meeting with lawyers' groups on 14 September, asking them to "act together, and help maintain stability". Chang Boyang, one of the group of volunteer lawyers, said he had filed a suit in Guangdong against Sanlu on behalf of the parents of one victim. One was already filed in Henan. Chang said that Henan's justice department had ordered 14 Henan lawyers to stop helping the kidney stone victims, saying it had become a political issue. He claims he was told by the official to "follow the arrangements set out by the government", and was further threatened: "If this suggestion is disobeyed, the lawyer and the firm will be dealt with." Zhang Yuanxin, lawyer and officer in the Xinjiang Lawyers' Association said that the actions of certain departments in government have "set back the development of the legal profession". He said that it was "intolerable" for government to interfere in the affairs of the judiciary, denying the right of ordinary citizens to sue. An official said that central government had issued instructions placing the cases on hold, pending a decision on how to handle the cases in a unified manner. Furthermore, that court was instructed not to give any written replies or accept Sanlu-related cases in the meantime. Stratfor believed that the act of adulterating milk and baby food in full knowledge of potentially severe sanctions, including execution, seemed like "an act of desperation". It noted that in 2008 dairy farmers became squeezed by growing costs of livestock, feed, facilities, and government-imposed price caps. Mengniu's share price fell 12% since October 2007 because of higher costs of raw milk (due partly to rising costs of cattle feed) and price controls—anti-inflation measures targeted at the dairy sector announced on 16 January. Milk suppliers accordingly resorted to subtler cost-cutting methods to preserve diminishing profits. Joseph Sternberg of the Wall Street Journal said that Beijing's failures of food-safety act are "much more pernicious, and disgraceful, than at first it appears ... [not only has this] milk poisoned thousands of infants with melamine, it also poisons the society at large with fear". Lawyer Bill Marler, speaking at a food safety conference in Beijing, said that this food scare has harmed the "made in China" brand abroad. He remarked: "If this product had gotten into the United States, it would have been 'game over' for a lot of products in China." The similarities between China today and New York 150 years ago shouldn't come as a great surprise. Adulteration on such a scandalous scale occurs in societies with a toxic combination of characteristics: a fast-growing capitalist economy coupled with a government unable or unwilling to regulate the food supply. In such get-rich-quick societies, there is a huge temptation to tamper with food, particularly when margins are low. The rewards are instant, and it's not always easy for consumers to detect the difference between the pure and the doctored—particularly with a substance like milk, which we have been taught to trust implicitly. An op-ed in the New York Times compared this to the "swill milk scandal" in New York in the 1850s in which 8,000 children reportedly died from milk from cows fed swill which was then whitened with plaster of Paris, thickened with starch, eggs and hued with molasses". The hopeful news in all this is that in the process of creating so much toxicity both the distressed loans and the distressed food are teaching us important lessons about the limits of scale and regulation that support the massive globalisation of the last decade. We are learning that regulators have lost the ability, if they ever had it, to truly monitor the extent of the danger. An article published in the San Francisco Chronicle likened the regulatory failures of the milk scandal to the distressed assets in the subprime mortgage crisis, and questioned whether regulators in either case ever understood or truly monitored the extent of the danger. Louis Klarevas, a professor at New York University's Center for Global Affairs, said of the products on the list of potentially harmful products reaching the US in recent years were exclusive to China: "Yet as more large-scale labor markets compete for their share of international trade, the incentives to cut corners will increase and the temptation to overlook hazardous goods might become a more common occurrence." On a more positive note Bill Durodié, then a senior fellow at the S. Rajaratnam School of International Studies in Singapore noted in 10 November 2008 issue of the Today newspaper there, in response to a question suggesting there may be more such incidents in future due to the more liberal trading relations with China, that: "exposing the Chinese to the world market is probably the fastest way of addressing these issues." Ron Unz compares the Chinese government and media reaction favorably to the coverage of the Vioxx scandal in the US, saying that "American journalists seemed to focus more attention on a half-dozen fatalities in China than they did on the premature deaths of as many as 500,000 of their fellow American citizens". Hu Xingdou (胡星斗), a professor at Beijing Institute of Technology, said: "There hasn't been an effort to establish a moral foundation to the market economy, and this incident is the inevitable result." Hu urged the leadership to transform the way of thinking, to repair the system, rather than dealing with problems as they arise. The dairy scandal raises the core question of whether the ruling Communist Party is capable of creating a transparent, accountable regulatory structure within a one-party system. Time Magazine cited many analysts saying the party's need to maintain control of the economy and of information undermines the independence of any regulatory system. One analyst, Willy Lam, a Senior Fellow at The Jamestown Foundation, indicated that CCP's pervasive control over political and economic resources has resulted in the absence of meaningful systematic checks and balances. "Institutions that could provide some oversight over party and government authorities—for example, the legislature, the courts or the media—are tightly controlled by CCP apparatchiks." A Beijing-based consultancy, Dragonomics, concurred that "the problem was rooted in the Communist Party's continued involvement in pricing control, company management and the flow of information". Independent regulation was lacking or ineffective as local industries' were so intertwined with local officialdom. The Times noted that while one child in 20 in Shanghai may have kidney damage as a result of drinking contaminated formula milk, on the other hand, "like the emperors of old, the new communist elite enjoy the finest produce from all over China, sourced by a high-security government department." Access Asia, a Shanghai-based consumer consultancy, said Fonterra was a classic example of western executives in China "believ[ing] advice in business books that they must avoid making their local partners 'lose face' at all costs." It suggested that Fonterra paid a heavy price in write-offs, a wrecked business and public condemnation. Caijing said the crisis revealed that there had been a "serious dereliction of duty" at the AQSIQ, and that the government had failed as a "night watchman". Citing public consensus that government should limit itself to a supervisory role, it urged the construction of a regulatory system which addressed the role of regulators watching over the production process, avoiding over-regulation, 'regulatory capture' and abuse of power by regulators. "Keeping the market in order and ensuring independent law enforcement should be part of the mandate." David Bandurski, journalist and researcher at China Media Project, criticised the crippling media controls by the state combined with "runaway commercial greed", and said that the censorship "suppresses information critical to the well-being of ordinary Chinese". He asserted that increased press freedom needs to be a component of any strategy to deal with this and other future food-security lapses in China. Free media in China could compensate for the underdeveloped rule of law, and be important in keeping companies and regulators honest. Bandurski cited warnings in the 9 October 2008 issues of Nanfang Daily and the Information Times for consumers to be aware of that problematic dairy stock (that produced before 14 September) have reappeared in some stores under cover of aggressive promotions. Former senior party official Bao Tong said "the more dark secrets are exposed, the better. You can't cure the disease, or save the Chinese people, until you get to the root of the problem." "If the Chinese government tries to play down this incident, there will be no social stability in China, let alone harmony ... It will mean that this government has lost the most basic level of trust." As a reaction to and comment on the scandal, Chinese artist and video animation producer Pi San created "Little Rabbit, Be Good" as part of his popular Kuang Kuang video series. Though officially banned or forbidden by the Chinese government, clever use of Chinese web services such as Baidu allows Chinese citizens to access this and many other forbidden materials. The search widened when some manufacturers tested positive despite reportedly not using Chinese milk. The Sri Lankan manufacturer of Munchee Lemon Puff biscuits, having tested positive in Switzerland, categorically stated that its powdered milk or milk products were sourced only from Australia, the Netherlands and Canada; similarly, Pokka products without milk or its derivatives from China were found by Vietnamese authorities to be contaminated. Japanese and South Korean authorities' tests on imported powdered eggs from China found melamine contamination. Japan found melamine in frozen fried chicken imported from China. The South Korean supplies were traced to two companies in Dalian. On 26 October, Hong Kong authorities discovered 4.7ppm melamine in eggs from Dalian. Hong Kong Secretary for Food and Health, York Chow, suspected the melamine came from feed given to the chickens that laid the eggs. On 29 October, Hong Kong authorities discovered a third batch of eggs containing excessive melamine. The Taiwanese Department of Health said that six batches of protein powder from Jilin and Dalian were found to contain 1.90 to 5.03ppm of melamine. Agriculture officials speculated that adulterated feed given to hens could explain melamine in eggs. The Web sites of Xinhua and People's Daily both carried a story from the Nanfang Daily that mixing melamine into animal feed was an "open secret" in the industry: melamine scrap was mixed into an inexpensive "protein powder" resold to feed suppliers. People in the trade interviewed by BusinessWeek also confirmed it was common practice, and had been going on for "years", with most believing it to be non-toxic to animals. Melamine dealers said after Sanlu, the government started clamping down on melamine sales to food processing companies or to manufacturers of animal feed. Malaysian authorities determined that ammonium bicarbonate, not milk, imported from China was the source of contamination at Khong Guan and Khian Guan biscuit factory. Malaysian authorities said it was probable cross contamination of batches from Chinese companies Broadtech Chemical Int. Co Ltd, Dalian Chemical Industries and Tianjin Red Triangle International Trading Co, and did not suspect adulteration. On 19 October, Taiwanese authorities detected melamine in 469 tons of baking ammonia imported from China. Samples tested showed up to 2,470ppm of melamine. Jorgen Schlundt, head of food safety at the WHO criticised China's food-safety system for being "disjointed", saying that "poor communications between ministries and agencies may have prolonged the outbreak of melamine poisoning." Public concerns have resulted in demand and egg prices falling throughout the country. Prices at a large Beijing wholesale market dropped 10%, and prices fell by 10% the day after news of the contamination broke in Hong Kong. Wholesalers have refused stock products without melamine inspection certificates. The Beijing Youth Daily reported that farmers have been forced to slaughter tens of thousands of chickens. In 2008, Zhao Lianhai (赵连海), a Chinese man whose son was sickened by tainted milk earlier that year, started a website called "Home for the Kidney Stone Babies" (结石宝宝之家, jieshibaobao.com), which helped families with children affected by tainted milk share their experiences, in part by maintaining a database of medical records. The website upset Chinese authorities, who detained Zhao in November 2009 and arrested him in December 2009. The Chinese government said that producers violating the law "could have their licenses revoked and be handed over to law enforcement organs". A senior Agriculture Ministry official said that of a quarter of a million feed-makers and animal farms inspected for melamine contamination, inspectors found more than 500 engaged in "illegal or questionable practices". Some 3,700 tonnes of feed with excessive melamine were seized. Hong Kong regulators have requested certification of exported eggs, but the central government has not yet mounted a centralised response; although mainland authorities already require eggs to be certified as free of avian influenza and Sudan red dye prior to export following previous food-safety scares, the AQSIQ has declined nationwide testing. Local government, for example Guangdong authorities, have increased random inspections at poultry farms. They declared to "harshly crack down on the unlawful behaviour of illegally manufacturing, selling and using melamine". On 2 December 2009, China detained three employees of Shaanxi Jinqiao Dairy Company in northwest China suspected of selling 5.25 tons of melamine-laced powdered milk to Nanning Yueqian Food Additive Company, in Guangxi. On 30 December 2009, Xinhua reported continuing problems: powder and flavouring products sold by another company involved in the original scandal–the Shanghai Panda Dairy Company–were found to contain illegal levels of melamine; the dairy was closed and three of its executives arrested. On 25 January 2010, it was reported that three food companies from Hebei, Liaoning and Shandong provinces had produced melamine tainted products in March and April 2009 and that the three companies were banned from selling products in Guizhou. On 10 February 2010 China's state council announced a food safety commission, consisting of three vice premiers and a dozen minister-level officials, to address the nation's food regulatory problems. The group aims to improve government coordination and enforcement and to solve systemic food safety problems. As part of its ongoing effort to find and destroy any melamine-tainted milk remaining on the market, the Chinese government announced that it was recalling 170 tons of powdered milk laced with the industrial chemical which was supposed to have been destroyed or buried in 2008 but has recently found to have been repackaged and placed back into the marketplace. In July 2010, Xinhua reported that authorities had seized 64 tonnes of dairy product contaminated with melamine from Dongyuan Dairy Factory, in Minhe County, in Qinghai, after authorities in Gansu discovered the contaminated powdered milk. Approximately 38 tonnes of raw materials had been purchased from Hebei, raising the possibility that traders had bought tainted milk that was supposed to have been destroyed after the 2008 scandal. Police have detained the owner and production director of the factory. Powdered milk produced in the plant was mainly sold in Zhejiang and Jiangsu, with only a small amount sold in Qinghai. Also, in Jilin, authorities were testing samples of suspect powdered milk produced in Heilongjiang. At the end of June 2010, Beijing lowered the minimum protein level for raw milk, from 2.955 to 2.8%, to discourage dairy farmers from attempting to falsify the passing of protein tests. Wu Heping, secretary general of the Heilongjiang Dairy Industry Association noted that between 75% and 90% of raw milk in some provinces had failed to reach the old protein level standard (in place since 1986) in 2007 and 2008. He said that the new standard reflected "the reality of the domestic dairy farm industry". However, insiders believe this will not stop adulteration because milk price still depends on protein content. ^ "中國奶業協會常務理事王丁棉向記者透露,事件對伊利、蒙牛、光明這三大品牌一線企業的打擊與影響,是較嚴重的。 " 他们的近期产品销售业绩已一落千丈,跌至同期数据的30%–40%。就全国乳品行业而言,它所受到的负面影响也是很大的,此场危机的最低谷波峰期可能要维持至2至3个月之久,至明年中期前仍会处于一个恢复期中。过了恢复期,市场应该开始有明显的反弹,整个事件的阴影淡化直到出现全面的复苏,也许还需要1至 2年的时间。但复苏的速度完全取决于消费者消费信心的恢复与树立。” 王丁棉感慨,这次事件对中国奶业造成的经济损失粗略估计应该超过200亿以上,可谓损失惨重。"
^ Branigan, Tania (2 December 2008). "Chinese figures show fivefold rise in babies sick from contaminated milk". The Guardian. London. Archived from the original on 5 December 2008. Retrieved 2 April 2010. ^ Scott McDonald (22 September 2008). "Nearly 53,000 Chinese children sick from milk". Google. Associated Press. Archived from the original on 10 February 2014. ^ Jane Macartney (22 September 2008). "China baby milk scandal spreads as sick toll rises to 13,000". The Times. London. Retrieved 2 April 2010. ^ "China 'fake milk' scandal deepens". NBC News. 22 April 2004. Archived from the original on 21 September 2008. Retrieved 25 September 2008. ^ a b c "China seizes 22 companies with contaminated baby milk powder". Xinhua News Agency. 16 September 2008. Archived from the original on 21 October 2012. Retrieved 2 April 2010. ^ a b c d e f "Two get death in tainted milk case". China Daily. 23 January 2009. Archived from the original on 5 June 2013. ^ a b "Crisis management helps China's dairy industry recover". Xinhua News Agency. 23 September 2008. Archived from the original on 24 December 2008. Retrieved 2 April 2010. ^ a b c Schlein, Lisa (26 September 2008). "China's Melamine Milk Crisis Creates Crisis of Confidence". Voice of America. Archived from the original on 13 October 2013. ^ Wu Jiao (1 November 2008). "Checks on animal feed 'tightened'". China Daily. Archived from the original on 30 April 2011. Retrieved 2 April 2010. ^ Zhuang Pinghui (24 November 2012). "Mystery surrounds death of milk whistleblower Jiang Weisuo". South China Morning Post. Archived from the original on 29 November 2012. Retrieved 7 February 2013. ^ "Melamine use "rampant" in China feed business". Reuters. 25 September 2008. Archived from the original on 30 September 2008. Retrieved 26 September 2008. ^ "Questions and Answers on melamine". World Health Organization. Archived from the original on 29 September 2008. Retrieved 3 October 2008. ^ Stephen Chen (18 September 2008). "Melamine – an industry staple". South China Morning Post. Hong Kong. pp. Page A2. ^ "Melamine and Cyanuric acid: Toxicity, Preliminary Risk Assessment and Guidance on Levels in Food" (Press release). World Health Organization. 25 September 2008. Archived from the original on 5 October 2008. Retrieved 3 October 2008. ^ Coghlan, Andy; Reuters (23 September 2008). "Melamine 'widespread' in China's food chain". New Scientist. Archived from the original on 25 December 2008. Retrieved 2 April 2010. ^ "Rush to find extent of NZ melamine contamination". stuff.co.nz. 25 September 2008. Retrieved 2 April 2010. ^ a b Gillian Wong (22 September 2008). "China's dairy farmers fret as milk scandal grows". International Herald Tribune. Associated Press. Archived from the original on 5 October 2008. Retrieved 2 April 2010. ^ a b c Josephine Ma (19 September 2008). "Adding chemicals to milk common: insiders, Page A3". South China Morning Post. Hong Kong. ^ a b c Gordon Fairclough (3 November 2008). "Tainting of Milk Is Open Secret in China". The Wall Street Journal. Archived from the original on 25 February 2014. Retrieved 2 April 2010. ^ a b "Spilling the Blame for China's Milk Crisis". Caijing. 10 October 2008. Archived from the original on 14 October 2008. Retrieved 2 April 2010. ^ Bradley, David (22 September 2008). "Melamine Scandal Widens". sciencebase. Archived from the original on 26 September 2008. Retrieved 2 April 2010. ^ Anita Chang (18 September 2008). "12 more arrested in China's tainted milk scandal". Google. Associated Press. Archived from the original on 21 September 2008. Retrieved 2 April 2010. ^ "Three more hospitalized in milk scandal". The Age. Australia. Associated Press. 24 September 2008. Retrieved 2 April 2010. ^ a b "China: 'Out of control' dairy system led to abuse Contaminated formula sickened at least 54,000 babies, killing four". MSNBC. Associated Press. 23 September 2008. Archived from the original on 27 September 2008. Retrieved 2 April 2010. ^ "Melamine FAQ". Centre for Food Safety, HK Government. Archived from the original on 24 October 2008. Retrieved 2 April 2010. ^ "More kidney stone cases found". The Standard. Hong Kong. 17 October 2008. Archived from the original on 4 June 2011. Retrieved 2 April 2010. ^ "Three milk program girls diagnosed with kidney stones". 10 October 2008. Archived from the original on 24 December 2008. Retrieved 2 April 2010. ^ "Taiwan reports 5 new melamine victims". Taiwan News. 26 September 2008. p. 3. ^ "Animals sick from Chinese milk". BBC News. 25 September 2008. Archived from the original on 28 November 2008. Retrieved 2 April 2010. ^ "Milk crisis data denial". The Standard. Hong Kong. 8 October 2008. Archived from the original on 4 June 2011. Retrieved 2 April 2010. ^ Yu Le (8 October 2008). "China milk victims may have reached 94,000". Reuters. Archived from the original on 9 February 2014. Retrieved 14 February 2014. ^ Charles Hutzler (15 November 2008). "Deaths uncounted in China's tainted milk scandal". Associated Press. USA Today. Archived from the original on 14 February 2014. Retrieved 2 April 2010. ^ Chow Chung-yan (2 December 2008). "Number of melamine-sickened children revised up five-fold". South China Morning Post. Hong Kong. pp. A9. ^ Langman, Craig (12 March 2009). "Melamine, Powdered Milk, and Nephrolithiasis in Chinese Infants". New England Journal of Medicine. 360 (11): 1139–41. doi:10.1056/NEJMe0900361. PMID 19196666. Archived from the original on 17 August 2009. Retrieved 13 August 2009. ^ Sun; et al. (2009). "Diagnosis and treatment of melamine-associated urinary calculus complicated with acute renal failure in infants and young children". Chinese Medical Journal. 122 (3). Archived from the original on 18 July 2011. Retrieved 17 August 2009. ^ Liu; Ren, A; Yang, L; Gao, J; Pei, L; Ye, R; Qu, Q; Zheng, X; et al. (22 February 2010). "Urinary tract abnormalities in Chinese rural children who consumed melamine-contaminated dairy products: a population-based screening and follow-up study". Canadian Medical Association Journal. 182 (5): 439–43. doi:10.1503/cmaj.091063. PMC 2842835. PMID 20176755. Retrieved 23 February 2010. ^ China Retail News, From AQSIS source. 18 September 2008. Retrieved 18 January 2013. ^ a b c Klaudia Lee (16 September 2008). "NZ alerted China to tainted milk, PM says". South China Morning Post. Hong Kong. p. A1. ^ Ritchie, Kerri (28 December 2009). "Fonterra denies advocating melamine use in milk scandal". ABC. New Zealand. Retrieved 17 November 2017. ^ "Chinese Milk Worker: Complaints Ignored For Years". NPR.org. Retrieved 27 November 2017. ^ a b "Timeline of China's tainted milk powder scandal". USA Today. 22 September 2008. Archived from the original on 14 February 2014. ^ "Food production supervision dept reply to query no.20080630-1622-25262". AQSIQ. Google. 2 July 2008. Archived from the original on 2 September 2008. Retrieved 13 September 2008. ^ "Toxic milk toll rockets in China". BBC News. 15 September 2008. Archived from the original on 26 December 2008. Retrieved 2 April 2010. ^ "Fonterra's Sanlu recalls milkpowder after babies sick". Otago Daily Times. 12 September 2008. Archived from the original on 9 June 2011. Retrieved 2 April 2010. ^ "Baby milk powder suspected in new China health scare". Reuters. 10 September 2008. Archived from the original on 24 December 2008. Retrieved 2 April 2010. ^ Maureen Fan (28 September 2008). "China's Tainted-Milk Crisis Grows Despite Official Claims". The Washington Post. Retrieved 2 April 2010. ^ a b "Probe finds producer knew of toxic milk for months". China Daily. 22 September 2008. Archived from the original on 25 October 2008. Retrieved 2 April 2010. ^ Ben Blanchard (1 October 2008). "China Milk Scandal Firm Asked For Cover-Up Help". Reuters. Archived from the original on 15 February 2013. Retrieved 14 February 2014. ^ Tim Hume (27 September 2008). "Leaked memo alleges milk 'cover-up'". The Sunday Star-Times. Archived from the original on 26 April 2014. ^ a b Jane Macartney; Sophie Yu (15 September 2008). "Chinese milk powder contaminated with melamine sickens 1,253 babies". The Times. London. Archived from the original on 17 September 2008. Retrieved 2 April 2010. ^ Stephen Hutcheon (15 September 2008). "Was China's milk scandal hushed up?". The New Zealand Herald. Archived from the original on 29 September 2008. Retrieved 2 April 2010. ^ Richard Spencer (15 September 2008). "China accused over contaminated baby milk". The Daily Telegraph. London. Archived from the original on 19 October 2008. Retrieved 2 April 2010. ^ Kristine Kwok (17 September 2008). "Officials knew of tainted milk for a month". South China Morning Post. Hong Kong. p. A4. ^ a b c d David Bandurski (7 October 2008). "Press Controls Feed China's Food Problem". The Wall Street Journal. Archived from the original on 26 October 2013. Retrieved 2 April 2010. ^ a b c Raymond Li (16 September 2008). "Censorship hammer comes down over scandal". South China Morning Post. Hong Kong. p. A5. ^ "China to destroy 10,000 tons of tainted baby formula". Xinhua News Agency. 15 September 2008. Archived from the original on 3 January 2009. Retrieved 2 April 2010. ^ "Officials, company manager sacked following baby milk powder scandal". Xinhua News Agency. 16 September 2008. Archived from the original on 3 January 2009. Retrieved 2 April 2010. ^ a b c Klaudia Lee (17 September 2008). "Tests find tainted baby milk at 21 more firms". South China Morning Post, p. A1. ^ "Death toll rises to four in tainted baby formula scandal in China". Xinhua News Agency. 18 September 2008. Archived from the original on 5 January 2009. Retrieved 2 April 2010. ^ Josephine Ma (23 September 2008). "Milk scandal fells product safety chief". Page A1, South China Morning Post. Archived from the original on 26 April 2014. ^ "China's Tainted Milk Scandal Hits Exports; World Health Organization said the number of sick could rise". Official Wire. 23 September 2008. Archived from the original on 23 May 2011. Retrieved 2 April 2010. ^ "MD of Sanlu detained for criminal charges" (in Chinese). Hebei. 17 September 2008. Archived from the original on 31 July 2013. ^ "More arrests in China milk scandal". The National. 18 September 2008. Archived from the original on 23 December 2008. Retrieved 2 April 2010. ^ Al Guo (16 September 2008). "First arrests made in tainted milk scandal". South China Morning Post. Hong Kong. p. A4. ^ Jiang Yuxia (10 October 2008). "Chinese police arrest suspect producing largest amount of 'protein powder' in milk scandal". Xinhua News Agency. Archived from the original on 3 January 2009. Retrieved 2 April 2010. ^ Ian Ransom (31 December 2008). "China dairy boss on trial amid new melamine scare". The Independent. London. Reuters. Archived from the original on 26 January 2009. Retrieved 2 April 2010. ^ Mark McDonald (22 January 2009). "Death sentences in China milk case". The New York Times. Archived from the original on 22 January 2009. Retrieved 2 April 2010. ^ "China executes two over tainted milk powder scandal". BBC News. 24 November 2009. Archived from the original on 28 November 2009. Retrieved 14 May 2012. ^ Davison, Isaac (23 January 2009). "Two sentenced to death over tainted milk scandal". The New Zealand Herald. Retrieved 22 January 2009. ^ "10 people convicted in China milk scandal have appealed: court". 2 March 2009. Archived from the original on 31 July 2009. Retrieved 29 July 2009. ^ "China executes two over tainted milk powder scandal". BBC News. 24 November 2009. Retrieved 6 August 2014. ^ Sarah McDonald (24 September 2008). "Fonterra posts $139 million impairment charge on San Lu stake". New Zealand National Business Review. Archived from the original on 14 October 2008. Retrieved 2 April 2010. ^ Michael Field; Andrew Janes (24 September 2008). "Fonterra takes 69pc SanLu writedown". Business Day. South Africa. Retrieved 25 September 2008. ^ Wang Qian (26 September 2008). "Sanyuan may take over tainted milk brand Sanlu". China Daily. Archived from the original on 17 June 2011. Retrieved 2 April 2010. ^ "Sanlu asset sales plan taking shape". New Zealand National Business Review. 19 November 2008. Archived from the original on 11 June 2011. Retrieved 2 April 2010. ^ Sharon Lee (26 December 2008). "Sanlu in $160m debt, assets up for grabs". 中国日报. Red Net. Archived from the original on 20 July 2011. Retrieved 2 April 2010. ^ a b Lee Spears (18 September 2008). "China Revokes 'Inspection-Free' Right as Milk Scandal Spreads". Bloomberg. Archived from the original on 22 October 2012. Retrieved 2 April 2010. ^ "Milk Powder Products From 22 Chinese Companies Contain Melamine". China Retail News. 18 September 2008. Archived from the original on 26 February 2010. Retrieved 2 April 2010. ^ a b "Most liquid milk in China does not contain melamine". Xinhua News Agency. 18 September 2008. Archived from the original on 23 October 2012. Retrieved 2 April 2010. 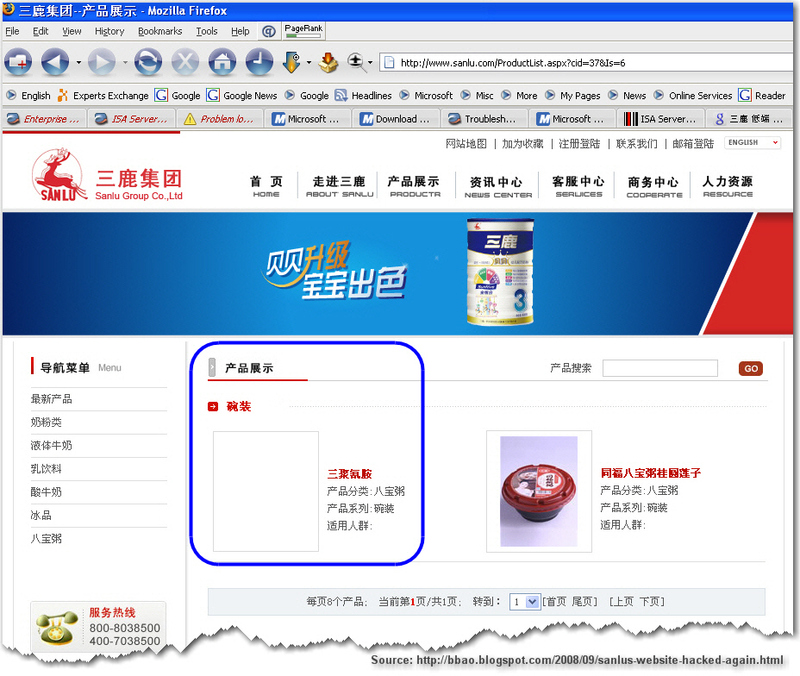 ^ "Yili, Mengniu, Bright Dairy lose their status as 'national brands'". China Central Television. 22 September 2008. Archived from the original on 15 June 2011. Retrieved 2 April 2010. ^ "China Mengniu Dairy shares suspended -HKex". Reuters. 17 September 2008. Archived from the original on 5 June 2011. Retrieved 2 April 2010. ^ a b "Investors dump financials and dairy producers". South China Morning Post. Hong Kong. 18 September 2008. ^ Jasmine Wang (20 September 2008). "Export milk less likely to be tainted, says firm". South China Morning Post. Hong Kong. pp. A2. ^ "New tests find melamine in 31 Chinese milk batches". Xinhua News Agency. 2 October 2008. Archived from the original on 23 October 2012. Retrieved 2 April 2010. ^ Jacobs, Andrew (2 December 2008). "Chinese Release Increased Numbers in Tainted Milk Scandal". The New York Times. Archived from the original on 8 May 2013. Retrieved 22 April 2010. ^ Zheng Chu (22 September 2008). "The Path to poison-free milk". The Economic Observer (386). p. 9. Archived from the original on 3 October 2011. Retrieved 2 April 2010. ^ Lee Spears; Wendy Leung (21 September 2008). "China Milk Scandal Spreads; Hong Kong Girl Sickened". Bloomberg. Archived from the original on 23 October 2012. Retrieved 2 April 2010. ^ a b Willy Lam (10 October 2008). "Milk scandal sours China's 'soft power'". Archived from the original on 4 June 2011. Retrieved 2 April 2010. ^ a b Al Guo (22 September 2008). "Dirty secrets of milk-faking capital". South China Morning Post, p. A5. ^ Al Guo (22 September 2008). "Dairy giants involved in scandal have spent millions on factories in Inner Mongolia". South China Morning Post. Hong Kong. pp. A5. ^ Austin Ramzyg (26 September 2008). "China's Tainted-Milk Scandal Spreads". CNN. Archived from the original on 1 October 2008. Retrieved 27 September 2008. ^ Anette Jönsson (5 August 2008). "Mengniu shareholders cash in $165 million". Finance Asia. Archived from the original on 16 February 2012. Retrieved 2 April 2010. ^ Bruce Connolly. "Big sky country offers niche opportunities". China–Britain Business Council. Archived from the original on 20 November 2010. ^ "Danish Arla says implicated in China milk scandal". Reuters. 16 September 2008. Archived from the original on 14 February 2014. Retrieved 2 April 2010. ^ "Soy: Starbucks In China Opts For Milk Substitutes". China CSA. 26 September 2008. Archived from the original on 17 July 2011. Retrieved 2 April 2010. ^ "Tainted milk crisis hits more global companies". International Herald Tribune. Associated Press. 26 September 2008. Archived from the original on 23 December 2008. Retrieved 2 April 2010. ^ "Cookies With Melamine Found in Netherlands". VOA News. 30 September 2008. Archived from the original on 14 February 2014. ^ "Inspekce na Slovensku opět našla melamin". České Noviny (in Czech). 10 October 2008. Archived from the original on 23 December 2008. Retrieved 2 April 2010. ^ "More melamine-tainted products seized". Times of Malta. 11 October 2008. Archived from the original on 13 October 2008. Retrieved 2 April 2010. ^ "Cadbury Withdraws China Chocolate on Melamine Concern Source: Reuters". Reuters. 29 September 2008. Archived from the original on 14 February 2014. Retrieved 14 February 2014. ^ O'Shea, Gary (30 September 2008). "Cadbury choc scare in China". The Sun. London. Retrieved 30 September 2008. ^ Ruwitch, John (5 October 2008). "Hong Kong finds melamine in two Cadbury products". Reuters. Archived from the original on 7 October 2008. Retrieved 5 October 2008. ^ "Lipton-brand milk tea powder recalled in Asia". CBS News. Associated Press. 30 September 2008. Archived from the original on 14 February 2014. Retrieved 14 February 2014. ^ "Lipton milk tea powder recalled in Hong Kong". USA Today. Associated Press. 30 September 2008. Retrieved 2 April 2010. ^ "Heinz to stop using Chinese milk in its products". New Mexico Business Weekly. 30 September 2008. Archived from the original on 3 October 2008. Retrieved 30 September 2008. ^ "Heinz stops buying Chinese milk products". Google News. Agence France-Presse. 30 September 2008. Archived from the original on 3 October 2008. Retrieved 30 September 2008. ^ "Taiwan minister allegedly attacked over tainted milk". Google. Agence France-Presse. 3 October 2008. Archived from the original on 4 October 2008. Retrieved 2 April 2010. ^ Dexter Roberts (31 October 2008). "Nestlé Combats China Food Scandals". Bloomberg BusinessWeek. Archived from the original on 6 November 2008. Retrieved 2 April 2010. ^ "Dairy supply for Olympics safe due to 'special management'". Xinhua News Agency. 17 September 2008. Archived from the original on 18 September 2008. Retrieved 2 April 2010. ^ "FACTBOX:China milk banned in Asia, Africa, Europe Union". Forbes. 27 September 2008. Archived from the original on 14 February 2014. Retrieved 2 April 2010. ^ "Gabon, Burundi halt sales of Chinese milk products". Stuff.co.nz. 21 September 2008. Retrieved 2 April 2010. ^ "Tanzania suspends milk imports from China". Alertnet. Reuters. 23 September 2008. Archived from the original on 26 September 2008. Retrieved 2 April 2010. ^ Economic Times, India (29 September 2008). "UAE bans Chinese dairy products". The Economic Times. India. Archived from the original on 30 September 2008. Retrieved 2 April 2010. ^ ABC Color, Paraguay (17 October 2008). "Salud prohibe ingreso de leche en polvo de China" (in Spanish). Archived from the original on 14 February 2014. Retrieved 2 April 2010. ^ "Myanmar to take action against China milk products". Associated Press. HighBeam Research. 20 September 2008. Archived from the original on 24 February 2014. Retrieved 22 September 2008. ^ "11 countries stop milk imports from China". NDTV. 23 September 2008. Archived from the original on 26 September 2008. ^ "A town selling its soul: parts of Hong Kong transformed by mainland shopping frenzy". scmp.com. ^ "Food and Health Bureau : Import and Export (General)(Amendment) Regulation 2013". fhb.gov.hk. ^ "Hong Kong Customs and Excise Department – Import and Export (General)(Amendment) Regulation 2013 ( with effect from 1 March 2013 ) – Quantity of Powdered Formula for Persons Departing from Hong Kong". customs.gov.hk. 3 June 2010. ^ "Mainlanders in Hong Kong: Parallel lives". The Economist. ^ "Hong Kong police fire pepper spray at anti-mainland protesters". Channel NewsAsia. Archived from the original on 17 February 2015. ^ "EU bans baby food with Chinese milk". CNN. 25 September 2008. Archived from the original on 30 October 2008. Retrieved 2 April 2010. ^ "EU bans baby food with Chinese milk, recalls grow". USA Today. 25 September 2008. Archived from the original on 14 February 2014. Retrieved 2 April 2010. ^ "France bans goods containing Chinese milk products". Stuff. 25 September 2008. Retrieved 2 April 2010. ^ "Candy with chemical in Chinese milk found in Conn". Associated Press. 1 October 2008. Archived from the original on 30 October 2008. ^ "China stops tainted sweet sales". BBC. 26 September 2008. Archived from the original on 27 April 2010. Retrieved 2 April 2010. ^ Richwine, Lisa (3 October 2008). "FACTBOX: No safe melamine level found for baby formula". Reuters. Archived from the original on 24 December 2008. Retrieved 2 April 2010. ^ "FDA: Trace Levels Of Melamine Allowed In Infant Formula". Dow Jones. CNN. 28 November 2008. Archived from the original on 4 December 2008. ^ "Melamine Intake for Some European Children Could be Three Times Above EU Safety Limits – EFSA". Flex News. 26 September 2008. Archived from the original on 25 February 2014. Retrieved 2 April 2010. ^ Margaret Harris (22 September 2008). "WHO not notified until 11 September ". South China Morning Post, p. A4. ^ "AFP, Has there been a cover-up, WHO asks". South China Morning Post, p. A3. 19 September 2008. ^ "China's Poisoned-Milk Scandal: Is Sorry Enough? By Simon Elegant / Beijing". Time. 23 September 2008. Archived from the original on 3 September 2011. Retrieved 2 April 2010. ^ "Countries should test Chinese dairy products: WHO". World Bulletin. Reuters. 25 September 2008. Archived from the original on 8 October 2008. Retrieved 2 April 2010. ^ "Calls for Chinese food ban after milk scandal". Irish Independent. 26 September 2008. Archived from the original on 4 November 2008. Retrieved 2 April 2014. ^ David Barboza (26 September 2008). "Asia Food Tainting Spreads, Leading to Recall in U.S". The New York Times. Archived from the original on 10 December 2008. Retrieved 2 April 2010. ^ a b c "Breastfeeding Drop Exposed in Milk Scandal, WHO Says". Bloomberg. 24 September 2008. Archived from the original on 24 October 2012. Retrieved 2 April 2010. ^ "Sanlu's website hacked again". Googler at Artarmon. 19 September 2008. Archived from the original on 1 October 2008. Retrieved 2 April 2010. ^ "Sanlu Group website hacked, Header bar changed to "Melamine"" (in Chinese). CNBeta. 12 September 2008. Archived from the original on 16 April 2010. Retrieved 2 April 2010. ^ "Melamine" added as a product name, Sanlu Group – Products Show". 19 September 2008. Archived from the original on 7 November 2008. Retrieved 2 April 2010. ^ Ben Blanchard (23 September 2008). "Chinese go online with food safety jokes". Reuters. Archived from the original on 28 September 2008. Retrieved 2 April 2010. ^ "Kidney Stone Gate: Latest Updates & Funny Sanlu Photoshops". ChinaSMACK. 21 September 2008. Archived from the original on 26 October 2008. Retrieved 2 April 2010. ^ Fiona Tam (18 September 2008). "What can I feed my baby now, poor parents ask". South China Morning Post. p. A2. ^ a b Gillian Wong, Associated Press (8 October 2008). "China Lawyers Face Pressure in Milk Cases". Time. Archived from the original on 15 January 2009. Retrieved 2 April 2010. ^ a b "Sanlu suit gets cool reception". South China Morning Post. Hong Kong. 9 October 2008. p. A7. ^ "Parents file lawsuit in China against dairy firm". The Jakarta Post. 2 October 2008. Archived from the original on 23 June 2009. ^ "Bad milk". NZ TV One. 19 October 2008. Archived from the original on 20 June 2009. Retrieved 18 October 2008. ^ a b c Sky Canaves; Juliet Ye & Kersten Zhang (31 October 2008). "Hong Kong Adds Tests For Melamine in Food". The Wall Street Journal. Archived from the original on 23 December 2008. Retrieved 2 April 2010. ^ Jane Macartney (14 November 2008). "US places ban on Chinese food imports". The Times. London. Archived from the original on 5 May 2009. Retrieved 2 April 2010. ^ a b c "China's Tainted Food Products Only Harm the Average People, High-Ranking Officials Have Their Own Specially-Supplied Food Sources". Digital Times. 20 September 2008. Archived from the original on 12 April 2010. Retrieved 2 April 2010. ^ "Amid milk scare, China's elite get special food". Associated Press. Daily News. 24 September 2008. Archived from the original on 11 October 2012. Retrieved 2 April 2010. ^ a b Simon Elegant (23 September 2008). "China's Poisoned-Milk Scandal: Is Sorry Enough?". Time. Archived from the original on 4 January 2009. Retrieved 2 April 2010. ^ Peter So (18 September 2008). "Mainlanders strain powder supply in Hong Kong". South China Morning Post, p. A2. ^ "大陸遊客金門搶購奶粉 (Mainland travelers rushing Kinmen stores for formula)" (in Chinese). Sina.com. 21 September 2008. Archived from the original on 22 December 2008. Retrieved 2 April 2010. ^ Barbara Demick (29 September 2008). "Formula fears speed return of wet nurses". The Standard. Hong Kong. Archived from the original on 30 September 2008. Retrieved 2 April 2010. ^ Tahana, Yvonne (11 October 2008). "Baby food sails out with Chinese crew". The New Zealand Herald. Retrieved 9 October 2008. ^ Chan, Tara Francis (24 May 2018). "Australia Post opens new 'concept store' that will only ship to China". The Sydney Morning Herald. Retrieved 26 May 2018. ^ "A poll on the mainland policy and cross-strait talks" (PDF) (in Chinese). Mainland Affairs Council of the Republic of China. 28 October 2008. Archived from the original (PDF) on 4 November 2009. ^ "Tens of thousands join anti-China rally in Taiwan". Google. Associated Press. 26 October 2008. Archived from the original on 2 October 2012. Retrieved 2 April 2010. ^ "Taiwanese question China ties amid milk scandal". Associated Press. HighBeam Research. 25 September 2008. Archived from the original on 14 February 2014. Retrieved 2 April 2010. ^ "DOH head quits over milk scare". China Post. Taiwan (ROC). 26 September 2008. Archived from the original on 26 September 2008. Retrieved 2 April 2010. ^ "Health minister resigns over milk crisis". The Taipei Times. 26 September 2008. Archived from the original on 28 September 2008. Retrieved 26 September 2008. ^ "Yeh Chin-chuan takes over at Taiwan Department of Health". Taiwan News. 26 September 2008. Archived from the original on 1 October 2008. Retrieved 26 September 2008. ^ "Yeh Chin-chuan successor to Lin Fang-yue". China Post. Taiwan (ROC). 26 September 2008. Archived from the original on 26 September 2008. Retrieved 26 September 2008. ^ "China's cabinet orders inspections, reform of dairy industry". Xinhua News Agency. 17 September 2008. Archived from the original on 3 January 2009. Retrieved 2 April 2010. ^ "China Focus: Chinese premier calls on sick infants". Xinhua News Agency. 21 September 2008. Archived from the original on 3 January 2009. Retrieved 2 April 2010. ^ "Hu Jintao underscores rural development, food safety on eve of National Day". Xinhua News Agency. 1 October 2008. Archived from the original on 1 December 2008. ^ Callick, Rowan (8 October 2008). "British politician Peter Mandelson ill after yoghurt in China". The Australian. Archived from the original on 21 June 2014. Retrieved 9 October 2008. ^ a b "10,000 Chinese children still sick from milk". USA Today. Toronto. 9 October 2008. Archived from the original on 9 February 2014. ^ "China Protest milk import bans at WTO meeting". International Herald Tribune. Associated Press. 12 October 2008. Retrieved 2 April 2010. ^ "("中国卫生部副部长刘谦在亚洲国家卫生部长会议后的记者会上说，外国公司针对中国毒奶粉提出的索赔要求将在商业层面解决，但是如果索赔遇到问题，中国准备通过外交渠道提供一切帮助。他敦促所有遇到问题的公司遵循市场规则，按照法律程序解决问题")". VOA Chinese. 10 October 2008. Archived from the original on 15 October 2008. Retrieved 10 October 2008. ^ "China scrambles to salvage reputation amid milk scandal". Google. Agence France-Presse. 25 September 2008. Archived from the original on 6 May 2010. Retrieved 2 April 2010. ^ "China Central Gov't to Subsidize Dairy Farmers After Tainted Milk Scandal". Xinhua News Agency. 4 October 2008. Archived from the original on 21 February 2014. Retrieved 2 April 2010. ^ Zhu Zhe (7 October 2008). "Six more detained over melamine". China Daily. Archived from the original on 27 May 2011. Retrieved 2 April 2010. ^ "Limits set on melamine levels". People's Daily. 9 October 2008. Archived from the original on 9 February 2014. Retrieved 2 April 2010. ^ 中央国家机关食品特供中心"相关信息属谣传 [Information on Central Government Offices Special Food Supply Centre are only rumours] (in Chinese). Xinhua News Agency. 26 September 2008. Archived from the original on 5 January 2009. Retrieved 2 April 2010. ^ "Most companies' baby milk powder safe – State Council". Xinhua News Agency. 17 September 2008. Archived from the original on 14 October 2012. Retrieved 2 April 2010. ^ "New dairy products not tainted". Xinhua News Agency. 6 October 2008. Archived from the original on 4 June 2011. Retrieved 2 April 2010. ^ "The Chinese milk crisis: Lessons for CSR". CSR Asia. 8 October 2008. Archived from the original on 8 July 2011. Retrieved 2 April 2010. ^ "Parents of China milk scandal victims detained". Reuters. 2 January 2009. Archived from the original on 18 February 2009. Retrieved 2 April 2010. ^ "China releases parents of melamine children: lawyer". Agence France-Presse. 3 January 2008. Archived from the original on 6 February 2009. Retrieved 2 April 2010. ^ Ng Tze-wei (23 September 2008). "Lawyers warned to shun milk suits". South China Morning Post. Hong Kong. p. A2. Archived from the original on 6 February 2009. ^ 冀律师透露「上面」要求/ 别涉及三鹿事件 [Lawyer reveals Central government requests not to get involved in Sanlu affair]. Ta Kung Pao (in Chinese). 22 September 2008. Archived from the original on 4 January 2009. ^ a b "Uproar Over China Milk Scandal". Radio Free Asia. 23 September 2008. Archived from the original on 3 January 2009. Retrieved 2 April 2010. ^ "China executes Zhang Yujun, Geng Jinping for roles in deadly tainted milk powder scandal". Associated Press. 24 November 2009. Archived from the original on 25 November 2009. ^ "Two executed over tainted milk that killed babies". ^ "Tian Wenhua, industry leader to disgraced prisoner". Xinhua News Agency. 22 January 2009. Archived from the original on 23 August 2012. ^ "China: The Economic Roots of the Milk Scandal". Stratfor. 10 October 2008. ^ Joseph Sternberg (10 October 2008). "Notes on a Milk Scandal". The Wall Street Journal. Retrieved 2 April 2010. ^ "Xiang and Marler Comment on Melamine Scandal From Beijing". Food Poisoning Attorney. 24 September 2008. Archived from the original on 4 January 2009. Retrieved 2 April 2010. ^ a b Bee Wilson (29 September 2008). "The Swill is Gone". The New York Times. Archived from the original on 4 May 2013. Retrieved 30 September 2008. ^ a b David E. Gumpert (13 October 2008). "What raw milk and the economic meltdown have in common". San Francisco Chronicle. Archived from the original on 26 December 2008. Retrieved 2 April 2010. ^ Louis Klarevas (23 October 2008). "Food: An Issue Of National Security". Forbes. Archived from the original on 26 October 2008. Retrieved 1 November 2008. ^ Ron Unz (18 April 2012). "Chinese Melamine and American Vioxx: A Comparison". The American Conservative. Archived from the original on 28 April 2012. ^ a b Jim Yardley; David Barboza (26 September 2008). "Despite Warnings, China's Regulators Failed to Stop Tainted Milk". The New York Times. Archived from the original on 26 April 2014. Retrieved 2 April 2010. ^ Michael Sheridan (28 September 2008). "China's elite eat pure food as babies die". The Times. London. Retrieved 2 April 2010. ^ Richard Spencer; Peter Foster (24 September 2008). "China milk scandal threatens giant dairy firm". The Telegraph. London. Archived from the original on 25 May 2011. Retrieved 2 April 2010. ^ "Tainted Milk: Regulatory Do's and Don'ts". English Caijing. 6 October 2008. Archived from the original on 10 October 2008. Retrieved 9 October 2008. ^ David Bandurski (29 September 2008). "Sanlu's public relations pawns: a relay of lies in China's media". The University of Hong Kong. Archived from the original on 3 May 2010. Retrieved 2 April 2010. ^ David Bandurski (11 October 2008). "Are poisonous dairy products are still on the shelves in China?". Journalism and Media studies centre, Hong Kong University. Archived from the original on 27 July 2011. Retrieved 2 April 2010. ^ "The Controversial Cartoons of Pi San". The New York Times. 26 October 2011. Archived from the original on 27 October 2011. Retrieved 26 November 2012. ^ "Where an Internet Joke is not just a Joke". The New York Times. 26 October 2011. Archived from the original on 27 October 2011. Retrieved 26 November 2012. ^ "Sri Lanka biscuit maker says withdrawing product to clear doubts". Lanka Business Online. 15 October 2008. Archived from the original on 13 July 2011. Retrieved 2 April 2010. ^ David Barboza; Chen Yang, Andrew Martin & Gardiner Harris (31 October 2008). "China's contaminated food scandal widens". The New York Times. Archived from the original on 13 February 2014. Retrieved 2 April 2010. ^ "Japan finds Chinese egg powder tainted". The China Post. Agence France-Presse. 18 October 2008. Archived from the original on 28 June 2011. ^ Malcolm Moore (27 October 2008). "China milk scandal spreads to eggs". Bernama. Archived from the original on 23 November 2010. ^ "Hong Kong tests more China food after egg scare". The New York Times. Agence France-Presse. 26 October 2008. Archived from the original on 9 February 2014. ^ "Hong Kong finds third egg sample tainted with melamine". Xinhua News Agency. 30 October 2008. Archived from the original on 4 January 2009. Retrieved 2 April 2010. ^ Shelley Huang (29 October 2008). "Chinese protein powder contains melamine: DOH". The Taipei Times. p. 1. Archived from the original on 9 December 2008. Retrieved 2 April 2010. ^ Anita Chang, Associated Press (31 October 2008). "Report: China's animal feed tainted with melamine". Google. Archived from the original on 9 February 2014. ^ David Barboza; Chen Yang, Andrew Martin & Gardiner Harris (31 October 2008). "China's contaminated food scandal widens". Retrieved 2 April 2010. ^ Teh Eng Hock (16 October 2008). "Melamine: Khong Guan, Khian Guan biscuits recalled". Archived from the original on 29 November 2010. Retrieved 2 April 2010. ^ Teh Eng Hock (23 October 2008). "Biscuit ingredient tainted with melamine". Archived from the original on 29 October 2012. Retrieved 2 April 2010. ^ "Taiwan government urged to locate melamine-tainted leavening agent". Taiwan News. 22 October 2008. p. 3. Archived from the original on 29 October 2012. ^ a b c Ian Ransom (31 October 2008). "China melamine scandal prompts mass chicken cull". Reuters. Archived from the original on 14 April 2009. Retrieved 2 April 2010. ^ "Hong Kong finds melamine in yet more China eggs". Reuters. 30 October 2008. Archived from the original on 10 February 2014. Retrieved 2 April 2010. ^ Cui Xiaohuo (3 November 2008). "Egg sales getting back to normal". China Daily. Archived from the original on 14 October 2012. Retrieved 2 April 2010. ^ a b Chao, Loretta; Dean, Jason (31 December 2009). "China Is Losing a War Over Internet". The Wall Street Journal. Archived from the original on 9 February 2014. Retrieved 2 April 2010. ^ "China feed makers guilty". Straits Times. Singapore. Associated Press. 1 November 2008. Archived from the original on 13 November 2010. ^ Blanchard, Ben (10 December 2009). "China detains three in new toxic milk scare". Reuters. Archived from the original on 14 November 2012. Retrieved 2 December 2009. ^ Stanway, David; Laurence, Jeremy (2 January 2010). "Shanghai dairy shut after melamine scare: report". Reuters. Archived from the original on 27 January 2010. Retrieved 2 January 2010. ^ Wines, Michael (25 January 2010). "More Tainted Dairy Found in China". The New York Times. Archived from the original on 28 January 2010. Retrieved 25 January 2010. ^ Bottemiller, Helena (11 February 2010). "China Launches Food Safety Commission". Food Safety News. Archived from the original on 12 February 2010. Retrieved 11 February 2010. ^ Michael Wines (9 July 2010). "Tainted Dairy Products Seized in Western China". The New York Times. Archived from the original on 10 November 2014. Retrieved 9 July 2010. ^ Zhuang Pinghui (14 July 2010). "Lower milk standard to ward off melamine use". South China Morning Post. ^ "Melamine traces found in French poultry feed". Reuters. 29 November 2008. Archived from the original on 14 April 2009. Retrieved 2 April 2010. ^ "France recalls tainted soymeal". Straits Times. Singapore. 29 November 2008. Archived from the original on 9 February 2014. Retrieved 2 April 2010. ^ 三聚氰胺溯源 [Where the melamine comes from]. Caijing (in Chinese). 29 September 2008. Archived from the original on 14 November 2012. Retrieved 2 April 2010. ^ 警惕库存问题乳品重返市场 [Dairy wary inventory problem returning to the market]. Nanfang Daily (in Chinese). 9 October 2008. Archived from the original on 4 January 2009.